We present a novel approach to define pure- and mixed-forest typologies from the comparison of pairs of forest plots in terms of species identity, diameter, and height of their trees. Forest typologies are useful for many purposes, including forest mapping, assessing habitat quality, studying forest dynamics, or defining sustainable management strategies. Quantitative typologies meant for forestry applications normally focus on horizontal and vertical structure of forest plots as main classification criteria, with species composition often playing a secondary role. The selection of relevant variables is often idiosyncratic and influenced by a priori expectations of the forest types to be distinguished. 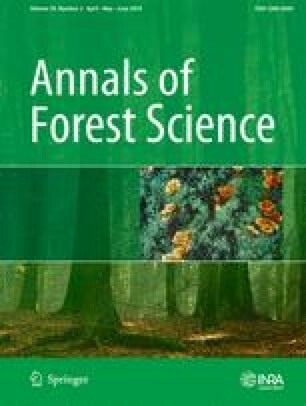 We present a general framework to define forest typologies where the dissimilarity between forest stands is assessed using coefficients that integrate the information of species composition with the univariate distribution of tree diameters or heights or the bivariate distribution of tree diameters and heights. We illustrate our proposal with the classification of forest inventory plots in Catalonia (NE Spain), comparing the results obtained using the bivariate distribution of diameters and heights to those obtained using either tree heights or tree diameters only. 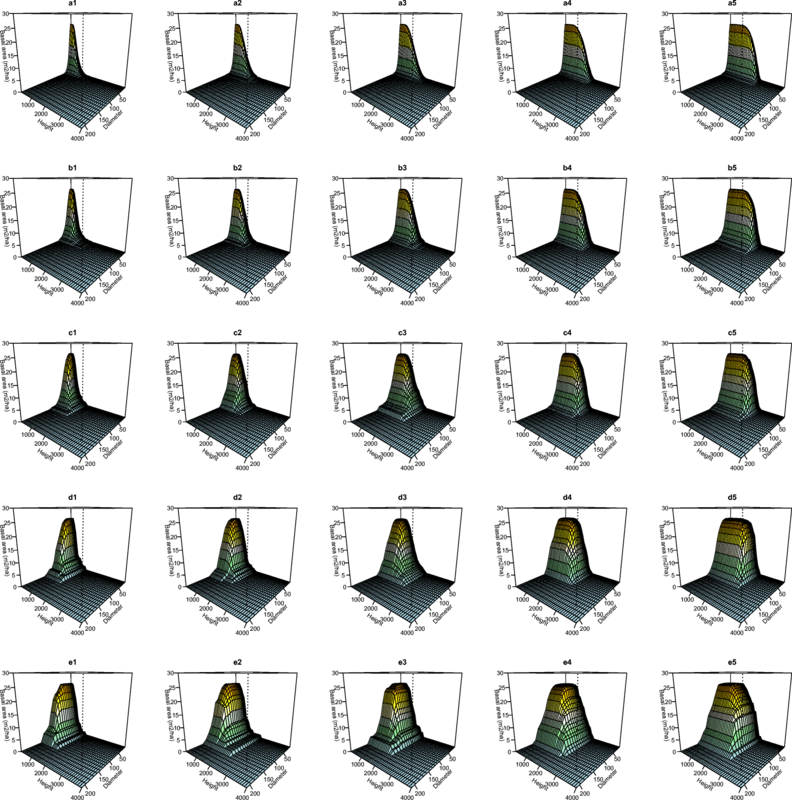 The number of subtypes obtained using the tree diameter distribution for the calculation of dissimilarity was often the same as those obtained from the tree height distribution or to those using the bivariate distribution. However, classifications obtained using the three approaches were often different in terms of forest plot membership. The proposed classification framework is particularly suited to define forest typologies from forest inventory data and allows taking advantage of the bivariate distribution of diameters and heights if both variables are measured. It can provide support to the development of typologies in situations where fine-scale variability of topographic, climatic, and legacy management factors leads to fine-scale variation in forest structure and composition, including uneven-aged and mixed stands. Contributions of co-authors: MDC and LC conceived the idea. MDC developed the methods and conducted data analyses. SMA and JRG contributed to interpretation of results. All co-authors contributed to manuscript writing. The online version of this article ( https://doi.org/10.1007/s13595-019-0824-0) contains supplementary material, which is available to authorized users. The authors would like to thank Mario Beltrán (CTFC) for useful discussions around the method and its potential applications. The study was supported by projects 979S/2013 (Autonomous Agency of National Parks, Spanish Ministry of Agriculture Food and Environment) and a Spanish “Ramon y Cajal” fellowship to M.D.C (RYC-2012-11109). We simulated forest tree data using Johnson’s Sbb distribution (Johnson 1949; Schreuder and Hafley 1977) to study the appropriateness of Dman and Dbray to reflect differences in terms of total basal area, tree diameter distribution and tree height distribution. For simplicity, we did not include differences in composition; these were considered in De Cáceres et al. (2013). In all simulations some parameters of the Sbb distribution were fixed (ρ = 0.8, δ1 = δ2 = 1.5). 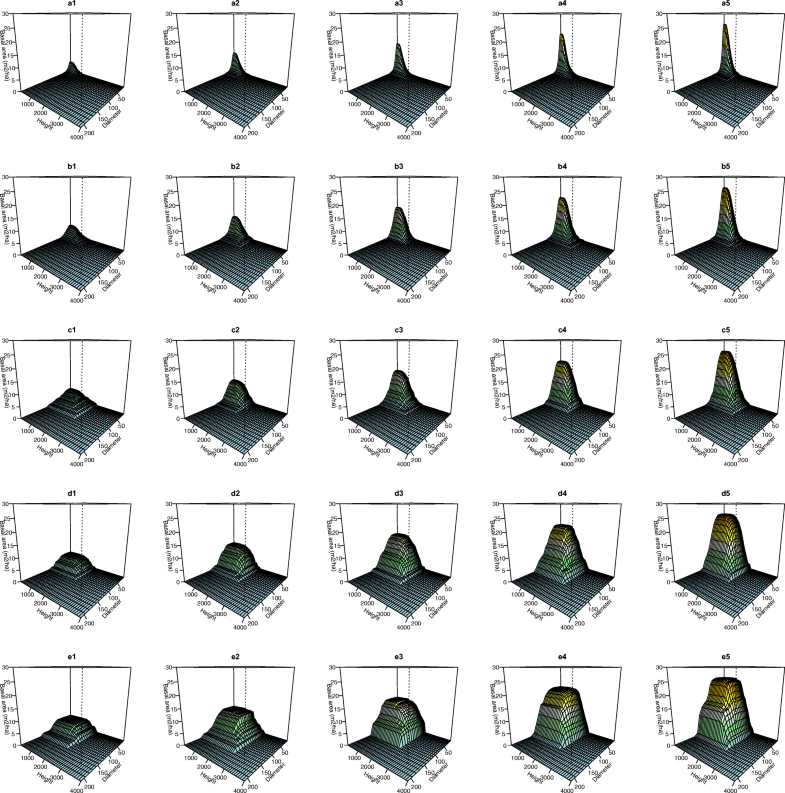 We changed parameters γ1 and γ2 of the Sbb distribution to simulate variations in the distribution of tree diameter and tree height. Five treatments were considered for each size variable (see Fig. 7). Five treatments of stand basal area were also considered: 5, 10, 15, 20, and 25 m2/ha. For each simulated stand we generated tree individuals until to the stand’s target basal area was met. In a first experiment, we generated 25 different stands by crossing the five treatments in stand basal area (labeled ‘1’ to ‘5’) with five treatments in tree size distribution (labeled ‘a’ to ‘e’), assuming that when trees were larger in diameter they were also larger in height (i.e., in treatment ‘a’ γ1 = −5 and γ2 = − 3; in ‘b’ γ1 = − 3.75 and γ2 = − 2; etc.). Thus, simulated stands were composed of few small individuals, many small individuals, few large individuals, or many large individuals; with intermediate situations being also covered. The CAS for each plot was built using basal area as abundance variable and tree diameter and tree height as size variables. We defined quadratic diameter bins, meaning that more classes were defined to distinguish thin trees than to distinguish thick trees. Specifically, diameter limits (in cm) for class r were defined as 4 + [(0.5·(r-1))2, (0.5·r)2] cm. The resulting classes were: 4–6.25 cm, 6.25–9 cm, 9–12.25 cm, 12.25–16 cm, 16–20.25 cm etc. Height classes were defined linearly using 100-cm bins. Figure 8 shows the CAS corresponding to each of the 25 simulated stands. hen calculated the resemblance between all pairs of simulated stands using either Dman or Dbray. 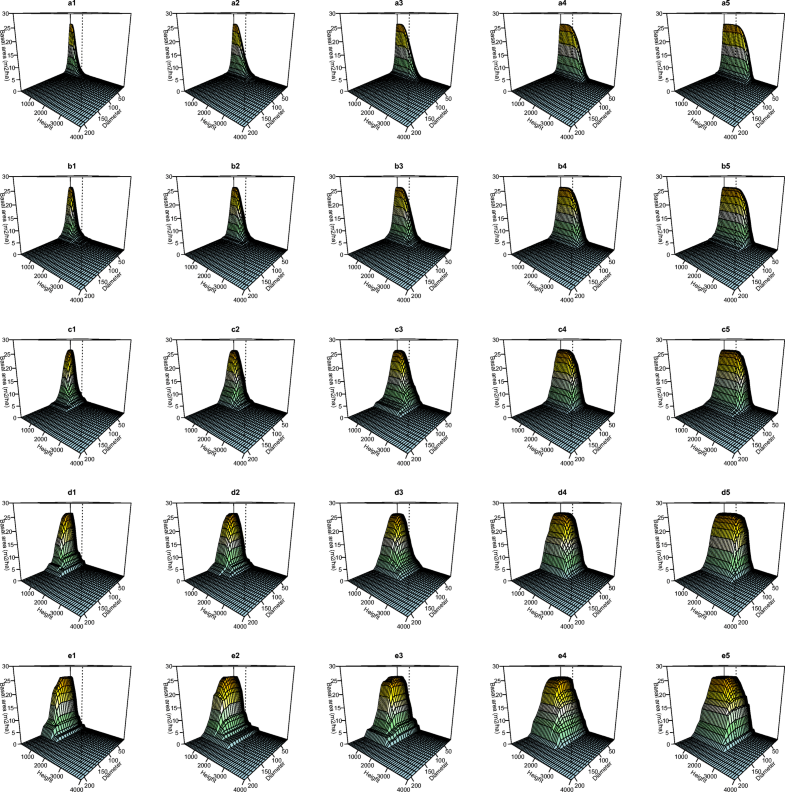 We used Kruskal’s non-metric multidimensional scaling (nMDS) to display each of the resulting dissimilarity matrices in a two-dimensional scatter plot (Fig. 9). Both coefficients were responsive to changes in total basal area and tree size. However, in the dissimilarity matrix obtained using Dman the distances due to differences in tree size were smaller between stands with small basal area than between stands with large basal area (i.e., compare sequences a1-e1 and a5-e5 in Fig. 9). Similarly, the distances due to differences in basal area were smaller between stands composed of small individuals than between stands composed of large individuals (i.e., compare sequences a1-a5 and e1-e5 in Fig. 9a). These patterns did not occur in the case of Dbray. Contrastingly, with this coefficient the dissimilarity between a pair stands differing in basal area was somewhat larger when the two stands had 5 and 10 m2/ha, respectively (i.e., a1 vs. a2, b1 vs. b2, …; Fig. 9b), than when they had 20 and 25 m2/ha, respectively (i.e., a4 vs. a5, b4 vs. b5, …; Fig. 9b). Similarly, the dissimilarity between pairs of plots differing in tree distribution was larger between small tree treatments (i.e., a1 vs. b1, a2 vs. b2, …; Fig. 9b) than between large tree treatments (i.e., d1 vs. e1, d2 vs. e2, …; Fig. 9b). In a second experiment, we calculated the resemblance among stands having all the same basal area (25 m2/ha) but differing in height distribution, diameter distribution, or both. In this case, we generated stands by crossing the five treatments in diameter distribution (labeled ‘a’ to ‘e’) with the five treatments in tree size distribution (labeled ‘1’ to ‘5’). Thus, stands could be composed of short and thin trees, tall and thin trees, short and thick trees, or tall and thick trees; with intermediates situations being also covered. The CAS for each plot was built as before (Fig. 10). 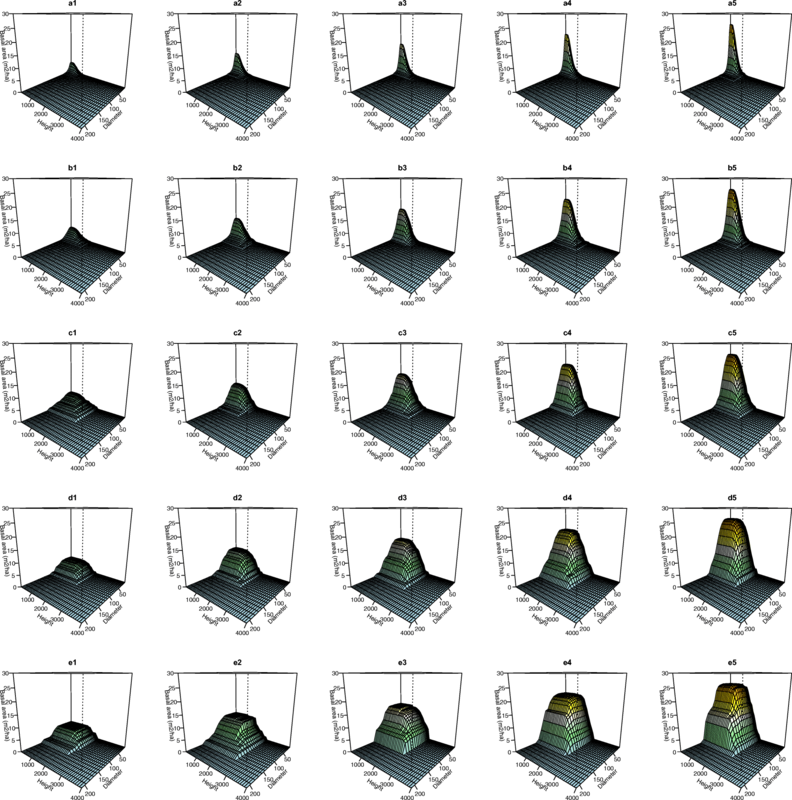 As with the first experiment, we calculated the resemblance between all pairs of simulated stands using either Dman or Dbray and displayed the resulting dissimilarity matrices using non-metric multidimensional scaling (Fig. 11). Both coefficients were responsive to changes in tree diameter and tree height. Although the effects where less obvious, the behavior of both indices was similar to the first experiment. With Dman the distances due to differences in diameter distribution were smaller between stands with short trees than between stands with tall trees and, similarly, the distances due to differences in tree height were smaller between stands composed of thin individuals than between stands composed of thick individuals (Fig. 11a). With Dbray the dissimilarity between stands differing in tree diameter was larger between thin tree treatments than between thick tree treatments and, similarly, the dissimilarity between plots differing in tree height was larger between short tree treatments than between tall tree treatments (Fig. 11b).